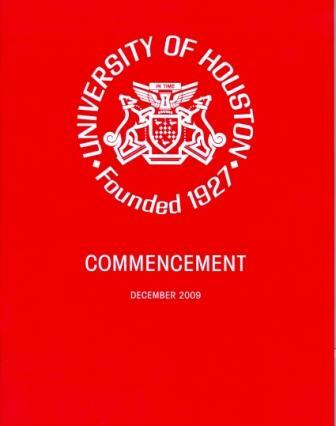 This event involved our daughter, Courtney Beard, receiving her degree at the University of Houston in Houston, Texas. Courtney received a dual degree in Bachelor of Science in Anthropology and Psychology. 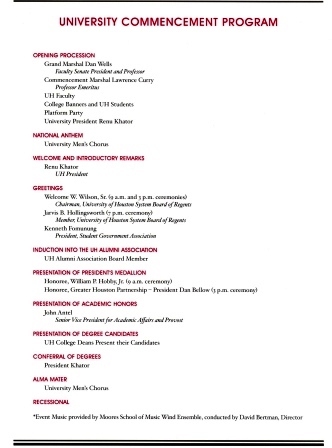 Graduation commencement book with schedule. Graduation ceremony starts; President of the university welcomes guests. Lighting was low, so pictures were not great. Courtney is in the center of each picture. William P. Hobby, Jr. speaks (center picture). Courtney in line to get diploma. Changing faculty as they start the Liberal Arts college. Courtney is 2nd in this line (left and center). Shaking hands with the President of the university (right). Courtney with her graduation cake.